As mayor of a city struggling its way through the Great Recession, I can sympathize with the people of Brick City, and appreciate their new documentary that much more. Despite having never met, Newark Mayor Cory Booker and I share many similarities. We were both born in 1969. We both played college football and earned Ivy League graduate degrees. We both shave our heads, as genetics have been unkind. Both of us were elected mayor in 2006 in communities facing enormous challenges. We won reelection to second terms by strong margins, found corporate benefactors (Facebook and Levi’s, respectively) and are both often accused of “being white” (though only I actually am). So though I'm not a television critic, I find myself in a unique position to review the second season of Brick City, the Sundance Channel's award-winning documentary series about life in Newark, New Jersey. Brick City is perhaps the finest show on television today. The quality of the characters with their ongoing narratives are expertly interwoven into a compelling and provocative arc. It's as if The First 48 and Meet the Press had a child, named her Brick City, and threw in Coach Carter for good measure. Educational as it is engaging, the show could be used as a teaching resource in high school civics classes everywhere—particularly in districts and communities where that resonance is most needed. Brick City rises and falls on its incredible cast of former gang members, struggling families, social activists, and of course, Booker himself. Cast favorite for this season easily goes to Dashaun “Jiwe” Morris, a former member of the Bloods gang and author of a memoir, War of the Bloods in My Veins that could, ironically, be his undoing. His sincerity, ideas, and obvious devotion to his family (and his all-or-nothing trial) make him, in many ways, the most compelling cast member. I simply cannot fathom how prosecutors believe society’s best interests are served by putting this young man behind bars. On the opposite end, title of "Least Favorite" squarely goes to the chain-smoking, Uggs-wearing, and hard-living Brooke Barnett, Esq. who comes across as more Jersey Shore than Brick City. The most dramatic (disappointing?) character of season two is city council member Ras Baraka. Baraka’s eloquent and stirring speech to a gymnasium full of students, after a rival school called off a football game due to gun violence, was the single most memorable scene from the first season. In season two, Baraka seemingly loses himself as the crusading and heroic principal, and descends into someone I didn’t recognize, consumed (overtaken?) by blind contempt for Booker. The level of access granted to the filmmakers is extraordinary. Yet despite the exceptionally open access, there is one aspect I hoped to see illuminated in this season's Brick City. As mayor of a community (albeit a much smaller one) facing similar challenges, both seasons have left me wanting to know, on a personal level, what the true psychological costs are for Booker—or are his Twitter/Facebook feed the truest reflection of the man? As mayors, we’ve both seen many of the same horrible and senseless things, endured the ceaseless, personal political infighting, lived amidst the hardships that are, for far too many Americans, an insurmountable reality. Consequently, despite my best efforts to keep it at bay, I suffer from depression and chronic anxiety. So I can’t reconcile Booker’s unrelentingly positive social media feeds with circumstances on the ground in Newark, especially the way many of the administration’s talking points—particularly on crime—tragically unraveled by the end of 2010. Brick City rises and falls on its incredible cast of former gang members, struggling families, social activists, and of course, Booker himself. Ultimately though, I suppose it is unreasonable of me to seek therapeutic consolation and entertainment from a TV show, especially when it delivers so much of the latter. 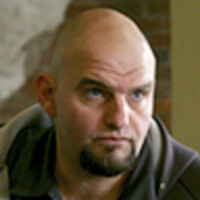 John Fetterman is the mayor of Braddock, Pennsylvania.